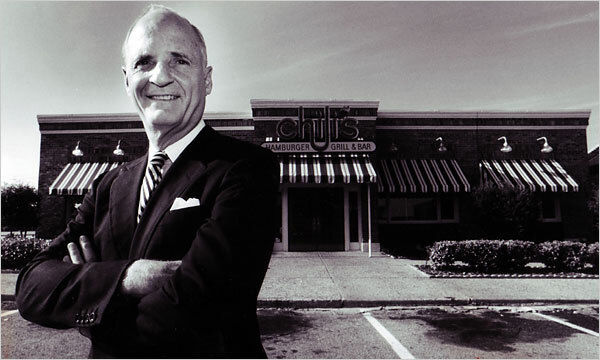 Norman Brinker in 1988 at one of his Chili’s restaurants. Norman Brinker, who helped put casual dining and salad bars on the American menu with the Steak and Ale and Bennigan’s chains, and went on to transform Chili’s from a small regional hamburger chain into one of the world’s largest restaurant companies, Brinker International, died Monday while on vacation in Colorado Springs. He was 78 and lived in Dallas. The cause was pneumonia, said his daughter Cindy Brinker Simmons. Mr. Brinker started in the restaurant business in the 1950s working with the founder of Oscar’s, a popular drive-in chain in San Diego that happened to own five little restaurants called Jack in the Box. Mr. Brinker expanded the Jack in the Box franchise so rapidly that he was named president of the company after two years. With Steak and Ale, he hit on the casual-dining format that has attracted millions of Americans eager for a budget meal with full service. In the mid-1970s, Bennigan’s Grill and Tavern, another of his concepts, brought the hanging plants and brass rails of “fern bars,” popular with young urban professionals, to restaurants priced for a mass audience. His greatest success, however, came with Chili’s Grill and Bar, 28 hamburger restaurants in Dallas and Houston that he developed into a casual-dining competitor to big chains like T.G.I. Fridays, in part by adding Tex-Mex dishes like fajitas to the original burger-and-chili menu. The chain went public in 1984, and in 1991 became Brinker International. In addition to Chili’s Grill and Bar, the company now owns two other chains, Maggiano’s Little Italy and On the Border Mexican Grill and Cantina, and operates nearly 1,700 restaurants around the world. Norman Eugene Brinker was born in Denver and grew up on a farm in Roswell, N.M., where he added to the meager family income by breeding rabbits, delivering The Roswell Daily Record and buying and selling horses. After graduating from New Mexico Military Institute, he sold insurance door to door and worked as the circulation manager for The Daily Record before enlisting in the United States Navy. On leaving the Navy he moved to San Diego, where in 1955 he married the tennis champion Maureen Connolly, who died in 1969. Two subsequent marriages ended in divorce. In addition to his daughter Cindy Brinker Simmons of Dallas, he is survived by his fourth wife, Toni; another daughter from his first marriage, Brenda Brinker Bottum of San Francisco; a stepson, Eric, of Peoria, Ill., from his third marriage, to the former Nancy Goodman; two children with his second wife, Margaret, Christina Brinker Aschtgen of Seattle and Mark, of Portland, Ore.; and five grandchildren. When Jack in the Box was about to go public in the early 1960s, he sold his 20 percent stake in the company and moved to Dallas, where he started a coffee shop called Brink’s, aimed at diners ages 25 to 44, a demographic group new to the idea of low-priced, quick-service restaurants. In 1966, he started Steak and Ale, a full-service restaurant aimed at middle-class customers who wanted steak at a reasonable price. At Steak and Ale, an eight-ounce filet cost $1.95, and a 16-ounce strip steak was $4.95. In another innovation, the chain introduced the salad bar, then usually encountered only at cafeterias. By 1976, when Mr. Brinker sold the chain to Pillsbury, Steak and Ale had 109 restaurants in 24 states. At Pillsbury, Mr. Brinker ran Steak and Ale and Bennigan’s as an independent division. In 1982, Pillsbury appointed Mr. Brinker chairman of its restaurant group, which at the time was the nation’s second-largest food-service operator, and handed him the assignment of reviving the flagging fortunes of Burger King. He oversaw the Battle of the Burger advertising campaign, which asserted that Americans preferred Burger King’s flame-broiled burger to McDonald’s grilled burger. Sales took off, and Burger King came close to erasing the gap with its chief competitor, but in 1983, Mr. Brinker left to run Chili’s, a chain he had tried to acquire for Pillsbury. Mr. Brinker’s triumphant run with Chili’s hit a major roadblock when he had a near-fatal polo accident in 1993. An accomplished horseman, he had competed with the United States equestrian team at the Summer Olympic Games in Helsinki in 1952. During a match at the West Palm Beach Polo and Hunt Club in Wellington, Fla., his horse fell on him after a collision with another player. He had 32 broken bones, remained in a coma for several weeks and was paralyzed on one side for nearly three months. Within six months he was back at work.